DVcreators.net has been known as the world leader in Final Cut training since the day Final Cut Pro 1.0 was released.We were the training company Apple chose to help launch Final Cut Pro with training on disc, in workshops in over 60 cities and all major trade shows. We have taught alongside Randy Ubillos, the creator of Final Cut Pro (and talked him into adding some cool features to the application!). We’ve helped hundreds of thousands of FCP editors further their Final Cut Pro knowledge. Most of the people currently writing books and teaching Final Cut Pro are our former students! Since the release of Final Cut Express, people have been asking for an Express-specific training course. Finally… here it is! Final Cut Express Foundations, is the quintessential Final Cut Express editing course, guiding users through every step of the essential editing process from organizing projects through capture, basic editing and fine-tuning to exporting the final project for delivery in the highest possible quality. Complete with student project files, Final Cut Express Foundations is the only chunkalized™ Final Cut Express training in the world! During the course, you’ll build “Mr. Right”, a short comedic tale of revenge and intrigue that steps you through editing a real world project incorporating many editing techniques and challenges that may arise in any project. Final Cut Express Foundations is focused on the goal of helping you perfect the fundamental set of tools, techniques and operations that make up 90% of the editing process of any project, from a corporate training video to an Academy-award-winning film. You’ll learn the easiest way to perform essential editing operations as well as a constant stream of precious and valuable secrets, tips, tricks, timesavers and techniques that will greatly improve the quality of your future projects and your editing experience. • how to export Quicktime movies with pristine quality for DVD or the web- the quality difference will knock your socks off! How is the course presented? We believe that in order to master any software, you must do, not just watch. 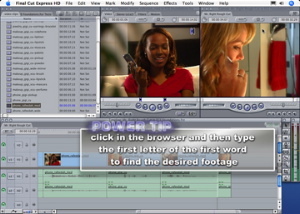 Final Cut Express Foundations is taught in our unique, innovative chunkalized™ learning environment, where you will actually build the tutorial project yourself in Final Cut Express, with the help of your virtual instructor. Each technique and process is presented as a series of clear, easy-to-understand steps. Why is this course far superior to the plethora of other training books and discs? Josh Mellicker has been editing with Final Cut Pro longer than any other human (outside the development team). He is well known as the creator of the original Final Cut training disc, Final Cut Pro PowerStart, and brings the experience of teaching several hundred live Final Cut training events to Final Cut Express Foundations. Instead of covering tools and concepts in an artificial order dictated by the software, the knowledge in Final Cut Express Foundations is presented in the context of completing a real world project. So, when working on your own projects, you’ll immediately be able to put what you’ve learned to work. What if the course goes too fast or too slow? In our chunkalized™ learning environment, you must verify that you comprehend and have completed each step in the process before your virtual instructor moves on. You learn at your own pace. Quickly move through sections you understand, have your virtual instructor repeat steps or sections, take “lab time” and experiment whenever you wish because you are the only student in this class. You have total control. If the course goes too slowly, you can play several chunks before switching into Final Cut Express. No one should learn alone. We have included an ”Ask a Question” button that posts your question on our forums for thousands of other Final Cut users to answer. You are always welcome to join us to ask questions, offer advice, and share tips with other students and your instructor. Should I buy Final Cut Express Foundations if I’ve been editing in Final Cut Express for years? The course is mostly designed for new users, with material that will be familiar to anyone who has been editing with Final Cut Express for a while. However, any editor who has not yet attained the mastery of the software they desire will find going through the whole course from the beginning solidifies and improves their understanding of Final Cut Express and the editing process in general. We do guarantee that in the constant stream of cool tips, shortcuts and secrets, you’ll learn at least a few new tricks that will help you in every project you edit. Click here to ask a question about this course or Final Cut Express. Were there sufficiently few changes between 3.5 and 4.0 to make this still a good product for those with 4.0? I’m switching to a Mac and so have no experience with either iMovie or Final Cut Express and based on reviews and blogs I’ve read, I’m planning on just starting in Final Cut Express. 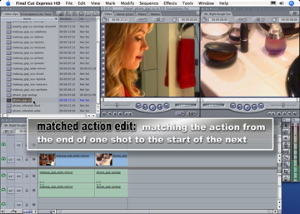 All the information in the tutorial is 100% up to date with Final Cut Express 4.0. Thanks! if I purchased the final cut pro foundation tutorials will i be able to use it with final cut express? I use final cut pro at work and express at home. which would you suggest? I’ve had my mac and the final cut pro v 4.0 for about a year now and can’t really get the grasp of fully using the final cut program. Will the final cut express foundations be able to help me get the best use out of my final cut v 4.0 from introduction of the program to fully capturing and editing my movies? If you have Final Cut Pro, I would recommend checking out our Final Cut Pro Foundations course here at http://dvcreators.net/final-cut-pro-foundations. Both courses are perfect ways to get started editing in the programs. While it was compressed to HD and looked great, it was a wee-bit out of sync. What are the exact settings when I use the Quicktime compression settings? With all the different formats, the instructional video could hardly provide in helping in such a specific issue.